New Delhi : The Minister of State for Tourism (Independent Charge), Culture (Independent Charge) and Civil Aviation, Dr. Mahesh Sharma has said that tourism has the potential to become the back bone of the economy of the country since it is a means to earn foreign exchange, generate employment and create women empowerment. Speaking at the interactive session and the press conference of Indian Association of Tour Operators (IATO) in New Delhi today Dr. Mahesh Sharma said that the world has became a global village and tourism is a powerful tool to connect our country to the rest of the world. Appreciating the role played by private stakeholders like IATO in promoting tourism in the country, Dr. Mahesh Sharma said that the participation of the private sector should be explored to the maximum possible extent to promote tourism and to meet tourism related targets. The Prime Minister, Narendra Modi has been playing the role of Brand Ambassador and promoting India before the world. The Foreign Tourist Arrivals (FTAs) from these countries visited by the Prime Minister have shown a substantial increase, Sharma disclosed. Highlighting the value of Indian Handicrafts as part of the Indian culture , the Minister said that promotion of handicrafts must be made an essential part of tourism promotion. Secretary, Ministry of Tourism, Dr. Lalit Panwar said that the measures like e-tourist visa taken up by the government recently have shown tremendous results. He requested IATO members to give it wide publicity and encourage tourists to make use of this facility. 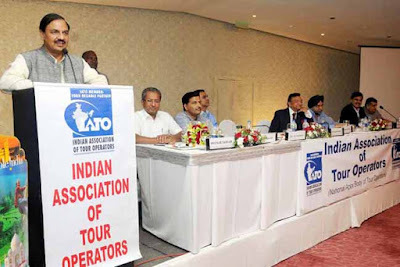 The President of IATO, Subhash Goyal disclosed the 31st annual convention of IATO will be held in Indore from 20th to 23rd August, 2015, which will also help to give fillip to tourism in the state.